Brand New STANLEY Mini Tripod Key Ring The Stanley Mini Tripod Keyring Torch has one 5mm super bright LED light, which emits white light. 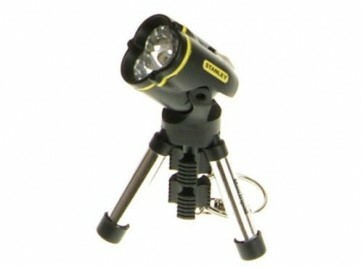 It has a full tripod mechanism allowing hands free use, and the 3 position rotating head allows the torch to be perfectly angled. The LED has 10,000 hour life. Supplied with 3 1.55V (LR41) Lithium cell batteries.